You are here: Home » News » News & Updates » Now You See Me…Now you Don’t! Now You See Me…Now you Don’t! Octopuses are masters of deception. They’re camouflage experts and when it comes to blending in, they’ve got it covered. For millions of years the ability to remain unseen, has been a survival strategy that has kept many animal species alive, including the octopus. And as it turns out, engineers have a lot to learn from these great illusionists. That’s right, researchers have turned to the octopus as a source of inspiration to develop a new material, with some pretty remarkable camouflage abilities. The material is able to change colour selectively, on demand, and represents a major leap forward in the field of materials science. Intrigued? Then you’re in luck, as here we’re going to take a closer look at this incredible research. Hiding in plain sight is what octopuses do best. Life can be pretty tough for these ocean inhabitants, but being masters of disguise makes it a whole lot easier! Octopuses are able to change the colour, and texture, of their skin in a matter of seconds, blending in with their environment seamlessly. Unlike chameleons, who use chemical signals to change the colour of their skin. Octopuses use a complex network of nerves and muscles to control their colour changes. It’s this remarkable ability that has made these animals the envy of engineers trying to develop more advanced cloaking devices. Materials scientist John Rogers, from the University of Illinois, is one such individual who is trying to harness the remarkable abilities of the octopus to develop new materials with some pretty amazing properties. Rogers teamed up with leading experts from a number of fields including marine biology and electrical engineering, and the material they produced is really rather extraordinary. The flexible, electronic material, is able to change colour to match its surroundings. This feat is made possible by a grid featuring a number of 1mm cells. These contain a thermochromic temperature-driven dye, that is capable of switching colour on demand. To produce this remarkable design, the team relied on the insights they learned from studying the astounding camouflage abilities of the octopus. More specifically, they copied the three-layer design, typically found in the skin of these animals. The bottom layer in this material contains a series of photo sensors. These can detect changes and light, and transmit a pattern to be copied to the ‘actuator’s in the middle layer above. The actuators which can be likened to the muscles within octopus skin, control the colour changes in the surface layer. Finally the top layer of the material is equipped with a temperature sensitive dye that appears black at low temperatures and transparent at precisely 47C. At the moment the material only responds in black and white, and as such it has a much more limited repertoire, than the octopus. But that said, this new development is still incredibly impressive. This is only the beginning, and the team hopes that their work could soon be extended to include a variety of exciting future applications. 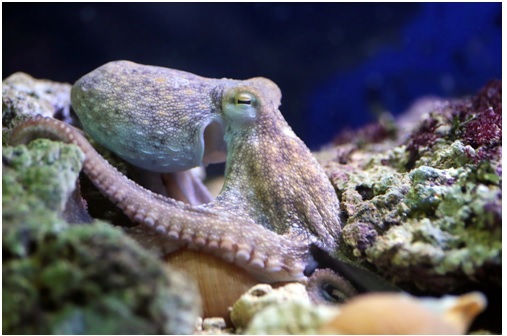 Artificial systems, capable of mimicking the amazing attributes of octopus skin could have a number of industrial, commercial and military applications. In fact, the possibilities are pretty much endless. Hence it will be exciting to see what’s next for this new form of camouflage, and where this technology could take us. As leading spring manufactures, here at European Springs we understand how important the right source of inspiration can be for driving forward innovation, and we just couldn’t resist bringing you this incredible story. We may not be masters of disuse, but we’re definitely masters when it comes spring manufacturing, and produce a wide range of high quality spring products, including torsion springs . If you would like more information about our spring products then simply contact us today, by giving us a call on +44 (0) 208 663 1800.